Explanation: Many spiral galaxies have bars across their centers. Even our own Milky Way Galaxy is thought to have a modest central bar. Prominently barred spiral galaxy NGC 1672, pictured above, was captured in spectacular detail in image taken by the orbiting Hubble Space Telescope. Visible are dark filamentary dust lanes, young clusters of bright blue stars, red emission nebulas of glowing hydrogen gas, a long bright bar of stars across the center, and a bright active nucleus that likely houses a supermassive black hole. Light takes about 60 million years to reach us from NGC 1672, which spans about 75,000 light years across. NGC 1672, which appears toward the constellation of the Dolphinfish (Dorado), is being studied to find out how a spiral bar contributes to star formation in a galaxy's central regions. Caramba ! this is nice. Is it possible two not so massive misterious objects ( black holes ) are orbiting papa black hole ? ta152h0 wrote: Caramba ! this is nice. Is it possible two not so massive misterious objects ( black holes ) are orbiting papa black hole ? Unlikely. Even if that were the case, however, it wouldn't have much effect on the structure of the galaxy. A central supermassive black hole just has too little mass to affect the galaxy as a whole. aye carumba is right! It doesn't appear to be a very flat galaxy, judging by the way the left-hand side of it looks. Makes it look more alive. Ann is going to like this one! Given this image of the galaxy NGC 1672 the central bar isn't visible, instead we see a hand. No arms, only fingers. The fingers are overlapping such as we might see as a hand is being opened. The link at "Hubble Space Telescope" indicates why. Beautiful galaxy! Will make an excellent background picture! I don't see any bar in this image. Am I missing something? skylark42 wrote: I don't see any bar in this image. Am I missing something? It's huge. Look to the sides of the central dust spirals. Beyond wrote: aye carumba is right! It doesn't appear to be a very flat galaxy, judging by the way the left-hand side of it looks. Makes it look more alive. Ann is going to like this one! Yes, I do. The resolution is great as is always the case for Hubble images, and the colors are quite good, due to the fact that this galaxy was imaged through no fewer than four filters, one blue, one green, one red and one infrared! I was wondering if you could be more specifc about the location of the bar. For example, does it point from the 2 o'clock to the 8 o'clock position on the photo? This might be a bit more helpful that "it's huge". Maybe the Tavern is closed for renovations. I can't see a bar anywhere, no matter how i look. Ya think it'll reopen soon ta152h0 has to have his cold ones ya know. Think of it like this. This galaxy is NGC 1232. NGC 1232 either has no bar or a very short bar. You can see that the yellow center of NGC 1232 is relatively round. You can also see that the spiral arms start right at the edge of the round center. In NGC 1672, you can see that there is a round center. This round center is surrounded by an elongated "S"-shaped brown dust structure. This dust structure is not a spiral arm, but rather it is part of the bar. Where do the spiral arms of NGC 1672 start? I'd say that the lower spiral arm parallels the shape of the "S"-shaped dust structure which surrounds the center, but the arm starts some distance below the end of that dusty "S". The lower arm has a long, dark dust lane running along its inside, and it is peppered with pink star formation regions and blue stars. Can you see it? As for the upper arm, there is a similar elegantly curving dust lane peppered with pink and blue star formation near the upper right corner of the picture. I think that is the beginning of the upper arm. If you click on this link, you'll come to a (large) picture by the space telescope GALEX which traces the hot ultraviolet stars of NGC 1672. (Note that the orientation of the GALEX image and the Hubble image are not the same.) In the GALEX image you can see the oval bar structure quite well, as well as the small round yellow center. You can see that the arms don't start at the small yellow center, but a considerable distance away from it. Note that you can see a set of large, faint outer arms too, which are not seen in visual light. Last edited by Ann on Mon May 14, 2012 8:35 am, edited 1 time in total. 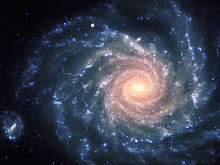 This is such a beautiful picture of a spiral galaxy! Together with the picture from Saturday, these are great APODs if only because the scales and distances of what we are viewing are so mind-blowingly immense and yet so elegant too. Thanks for taking the time to write such detailed, informative posts Ann! That's the thing, though. It's so big and so obvious that you must be looking too close to see it. It's between the 2 and the 7 o'clock positions. Thanks for taking the time to write such detailed, informative posts Ann! You're so very welcome, Starstruck, and thanks for the praise! Ok. So that's the bar. But it doesn't look like a bar. Must be one of those things like not being able to see the forest, because there are too many trees in the way.